Remember when all the cool kids had pedal cars, or tractors? It’s not too late to own your favorite. 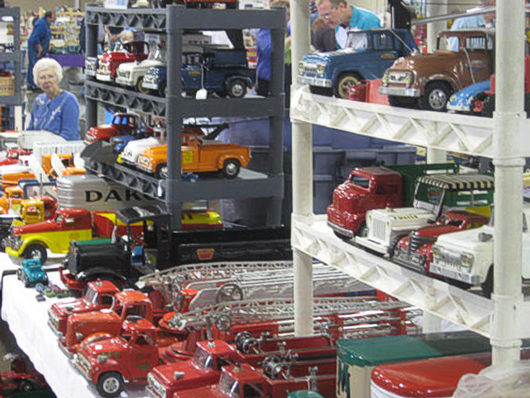 Choose from models made by Kidillac, Murry, Steel Craft, Garton, BMC, AMF, and more. 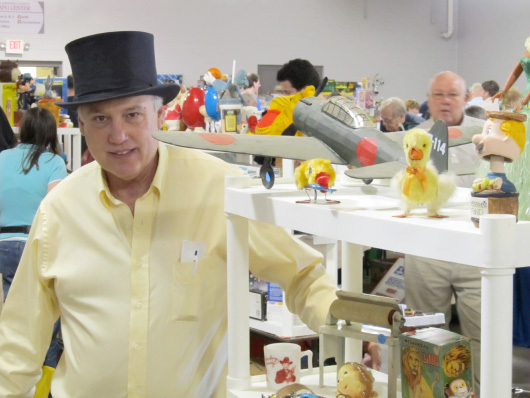 Mike from Morphy’s Auction House offers some premium collectible toys, and some seldom seen advertising displays. He also specializes in vintage Batman toys. Large antique pressed steel trucks are impressive. 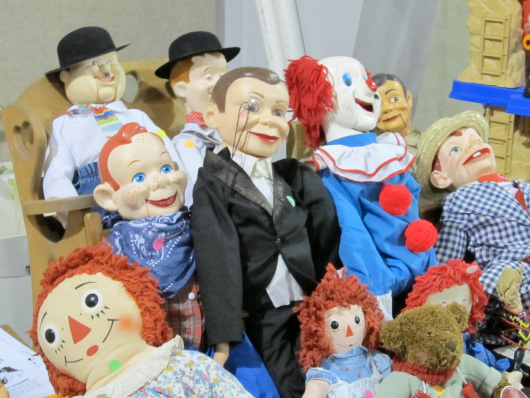 There are many to choose from, in restored or original condition. Manufactures include Keystone, Buddy L, Steel Craft, Sturditoy, Metal Craft, and Cor-Cor among others. This vendor had something for everyone. 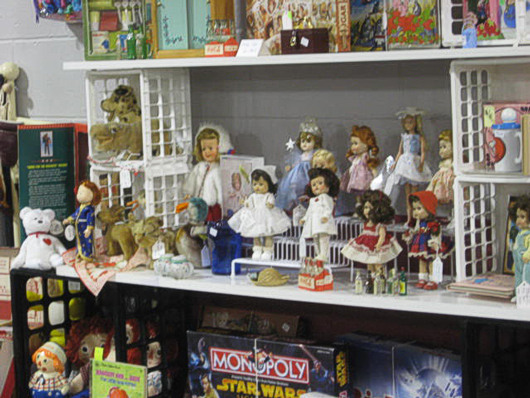 A pressed steel arcade shooting game, comic books, Japanese tin cars, trains, Disney figures, dolls, and pull toys. Barb, one of our many female vendors will always greet you with a smile. 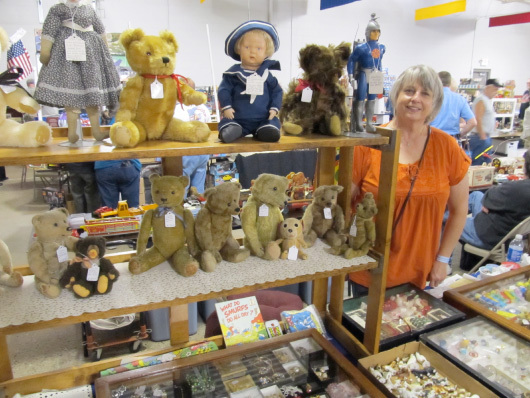 She always has a great selection of old Steiff bears, and other interesting items. 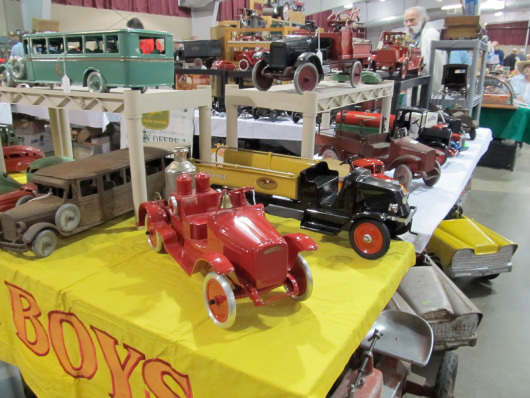 Are you a collector of farm toys? 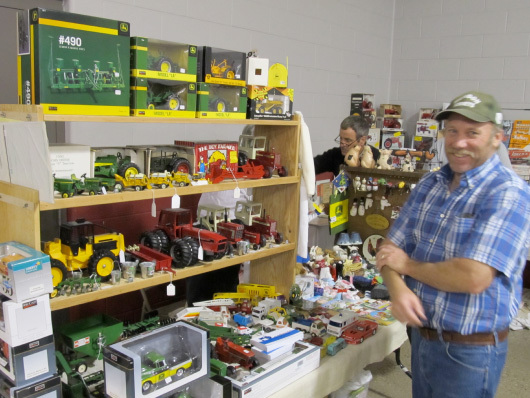 Then come select your favorite tractor or implement from John Deere, Case, International, Oliver, Moline, Allis Chalmers, Farmall, and many more. Jerry from MN had some nice petroleum and dealership porcelain signs. 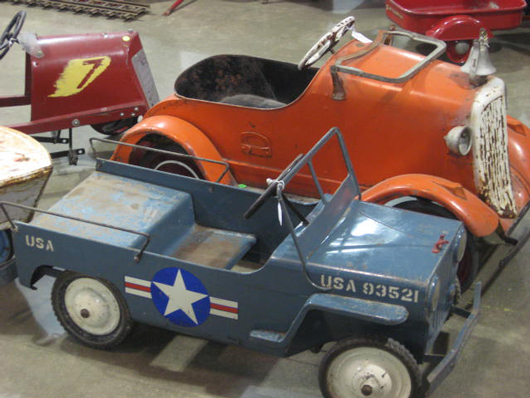 He always has a great selection of pedal cars, pressed steel and tin transportation vehicles. Check out this mint condition friction powered super sonic jetliner. 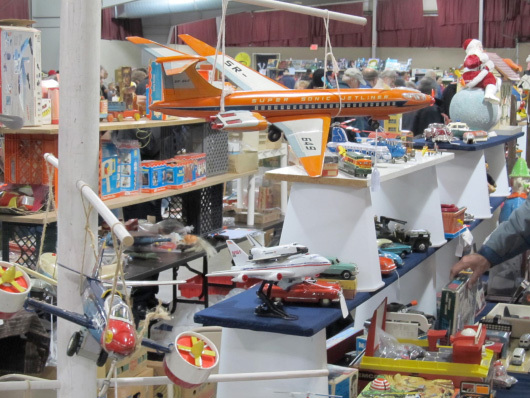 This vendor has many tin & friction battery operated aviation toys for sale. Julian, of Thomas Toys helping a customer with a reproduction replacement part. Come see Julian for parts that are missing on your favorite toy. 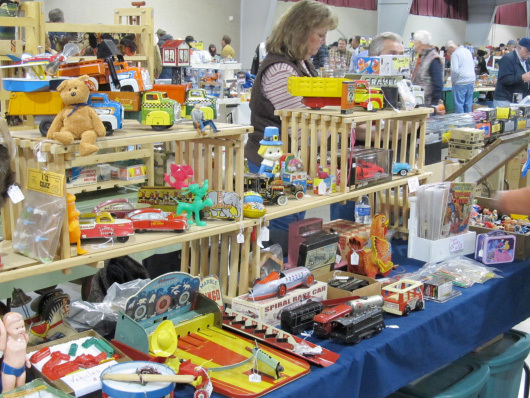 Collectible dolls and doll house furniture of all types shared this vendor’s booth along with 1960’S Hot Wheels, Corgi, and Match Box cars. 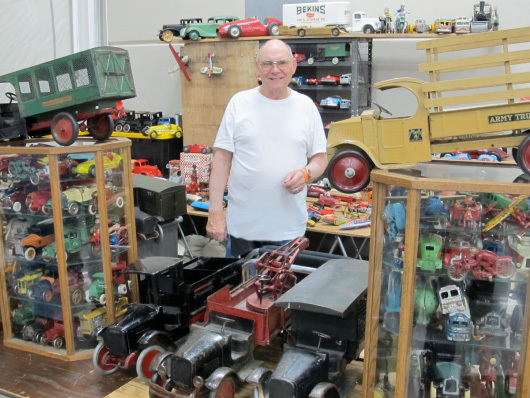 Dan from Reno NV selling some of the best pressed steel, cast iron, and tin transportation toys you will ever see. 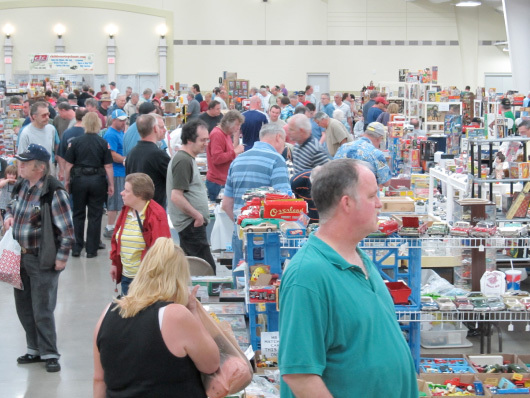 A view down one of the isles of the Main Expo Hall shows a flurry of activity between buyers and sellers. 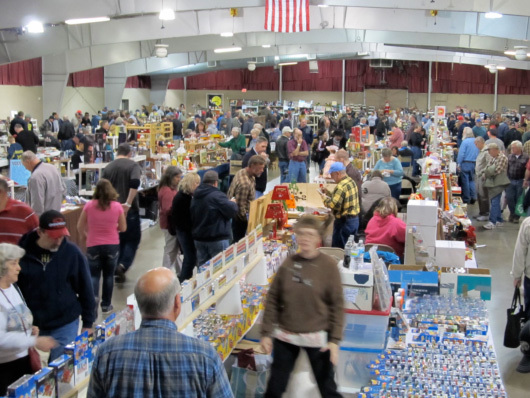 Make plans now to participate in our next Kalamazoo Toy Show! 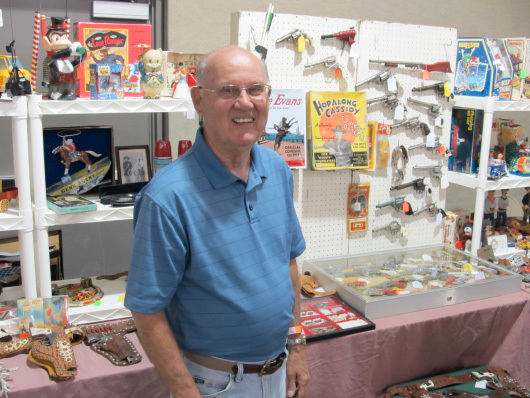 A great selection of western toy memorabilia included Wyatt Earp, Gene Autry, Roy Rogers, Hop along Cassidy, and the Lone Ranger. Many of the cap guns offered even had the original leather holsters. A wind up 1930’S roller coaster and Hercules Ferris wheel made by Chein, drew lots attention in this vendors booth. 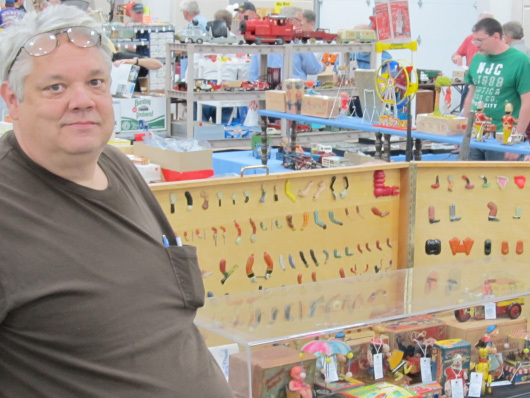 Randy from IN is the owner of Randy's Toy Shop. He works with tin, wood and plastic, and even created a special process to repair celluloid. 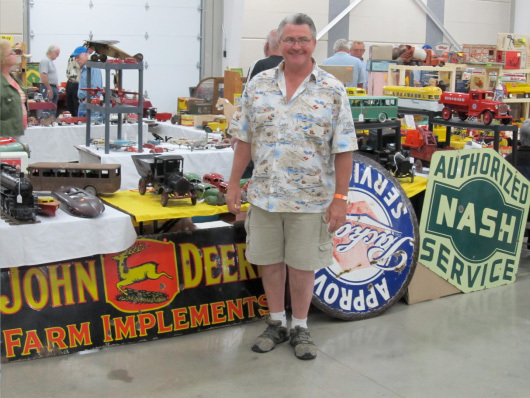 See Randy for all your antique toy repairs. Steiff and other brands of old stuffed animals. 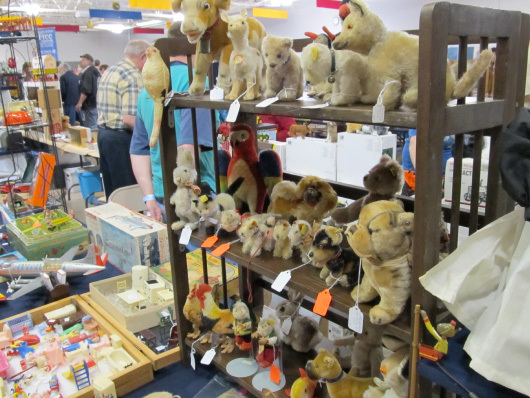 Take your pick of roosters, chickens, rabbits, mice, birds, bears and more. 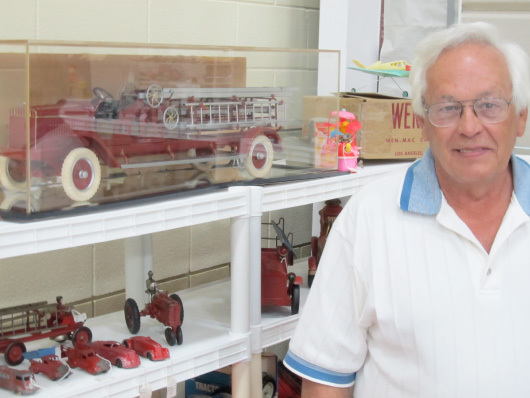 Tom from IN, had this impressive fire truck for sale along with cast iron cars, old tractor toys, and other unusual hard to find toys. 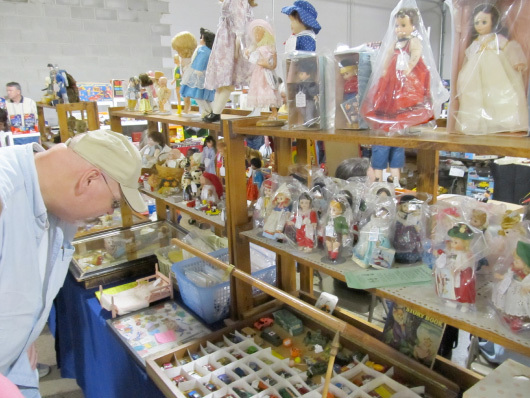 Casper the ghost takes center stage among all the great items on this sellers table. 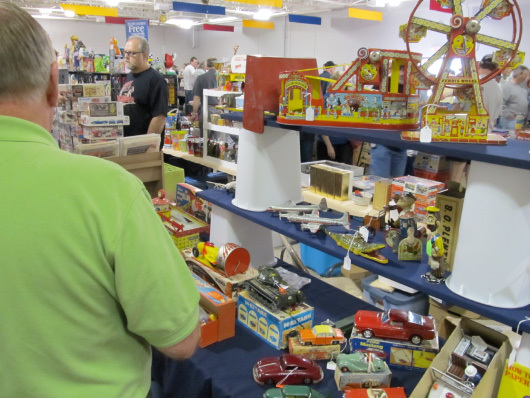 A tin toy crane, Tonka trucks, board games, farm toys, and vintage cartoon puzzles. Formal attire is not required at our events, however Mike likes to ham it up from time to time. 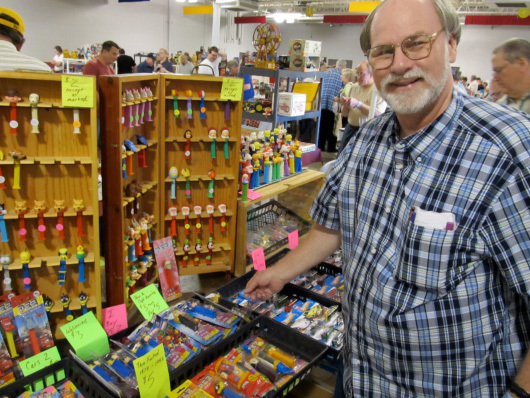 He sells battery operated tin toys bobble heads, TV & Movie memorabilia and lots more. 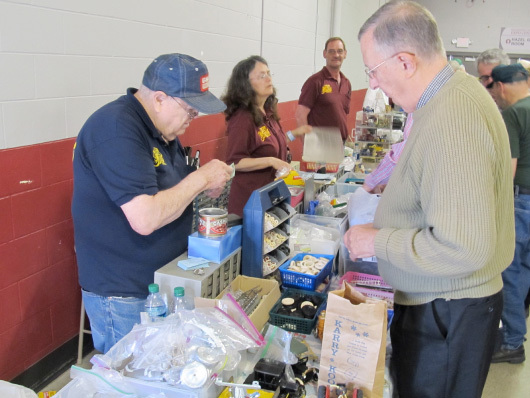 Vintage cast iron toys, included salesman sample stoves, mechanical toy banks & safes, figural door stops, antique cannons, and a few Hubley Harley Davidson motorcycles. 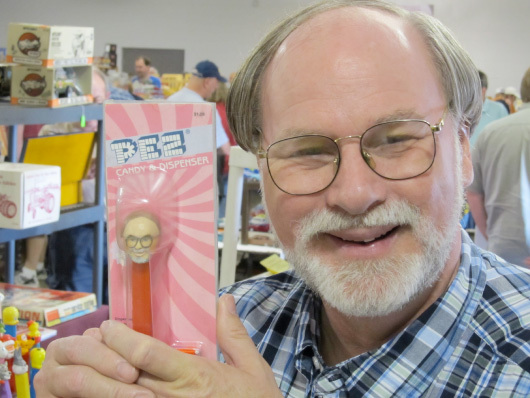 Pez anyone? Add to your collection with the hundreds offered for sale. Ninja turtles, Star Wars, Disney, Flintstones, Sesame Street Muppets, Smurfs, Looney Tunes, or a variety of super heroes. 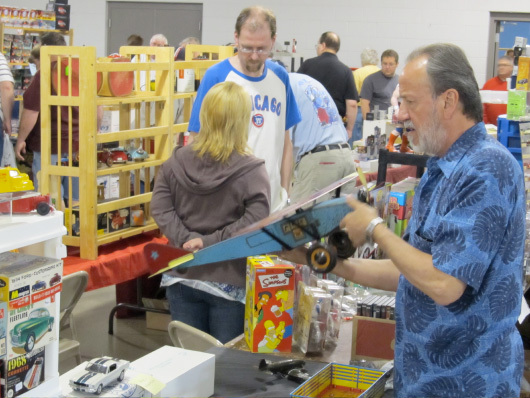 A potential buyer examines an antique metal vintage airplane toy. No matter what you’re searching for, you’re sure to find something after shopping this show. A view of the South Expo Hall. This hall adjoining the main Expo Hall offers nearly 50,000 square feet and 500+ tables of indoor shopping! A nice selection of old Tonka, Smith Miller, Buddy L, Nylint, Doepke, and Wyandotte pressed steel trucks for sale. Antique fire truck toys, construction trucks, and over the road haulers were all here. Cast iron vehicle toys offered for sale made by Hubley, Arcade and A C Williams. 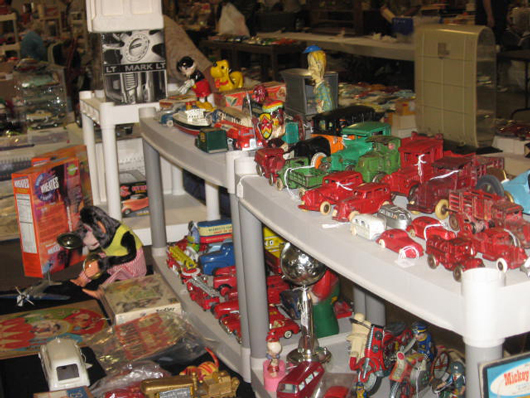 Also included on this table were some Japanese battery operated tin toys. 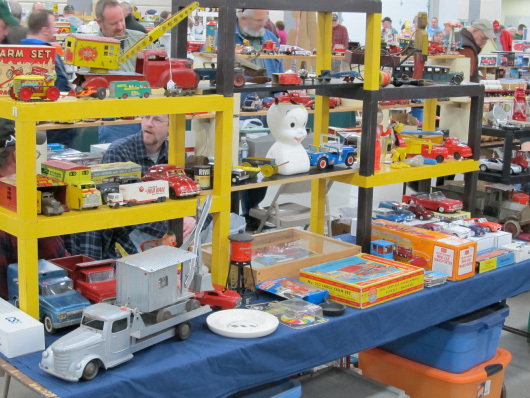 Pedal cars and tractors are a big attraction at the Kalamazoo Toy Show. 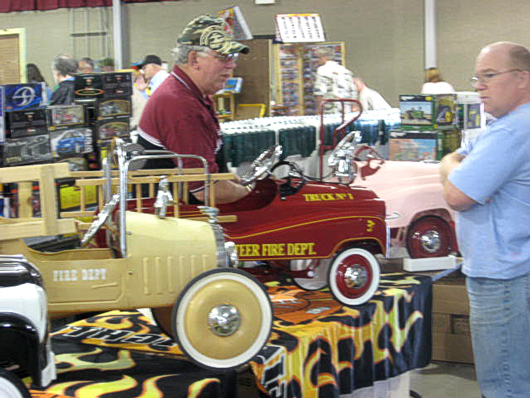 This pedal car fire truck and pedal car army jeep are a couple of great examples of what you'll find at Michigan's Kalamazoo Toy Show. 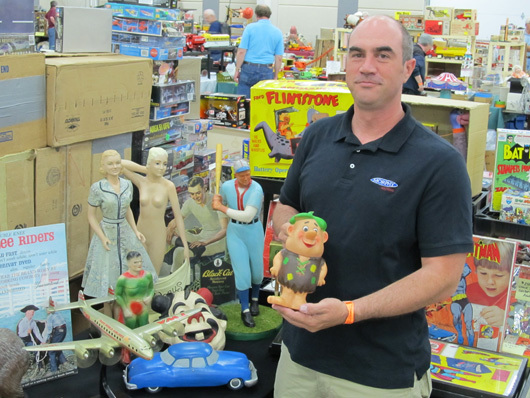 Monster toys and figures from the 1960’S are very collectible items. 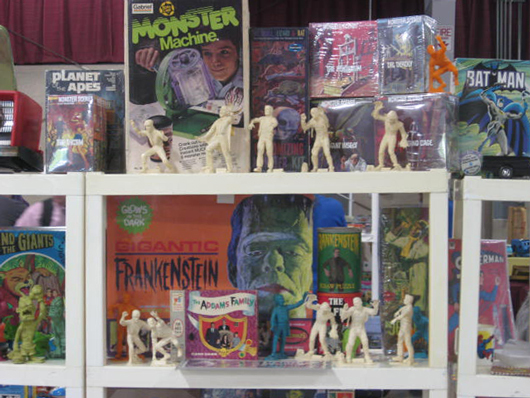 Figures from Planet of the Apes, Frankenstein, Land of the Giants, Batman, the Addams Family, and Superman were all for sale. Also offered were “scary” monster model kits and board games. What’s better than a used car salesman? A restored pedal car salesman of course! These pedal car fire trucks are some of the real beauties being offered, all ready to be pedaled away. 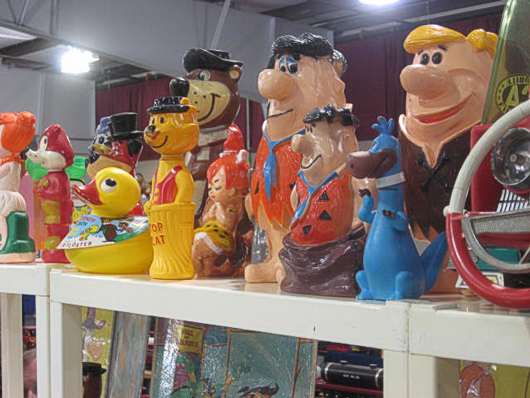 Cartoon character toys in the form of banks, statues, and Soakies bath soap containers lined this top shelf. 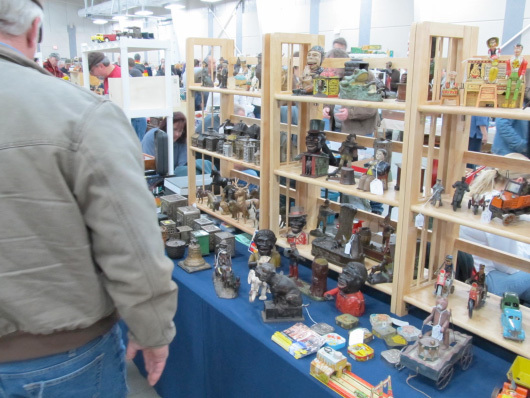 Yogi Bear, Fred Flintstone, Pebbles, Barney Rubble and Dino were all keeping an eye out for a potential buyer. 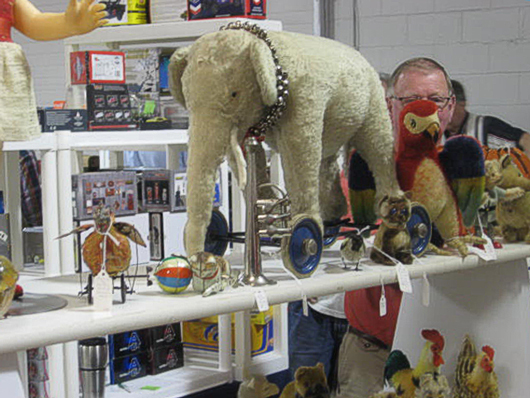 An old elephant pull toy was just one of the great antique animal related toys offered at these tables. 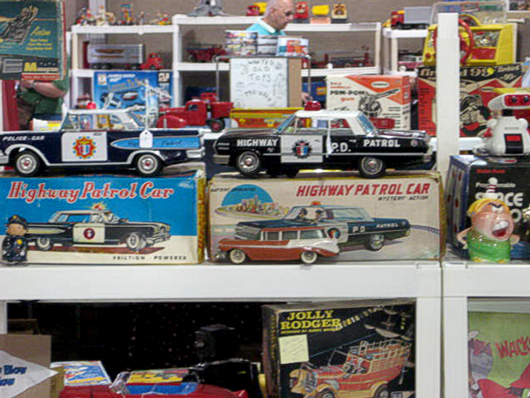 A battery operated toy collector’s table features some mint Highway Patrol Car police cars with boxes, a Jolly Rodger and a variety of other battery operated toys. You can’t miss the promo guys at this show! They always have the best selection. 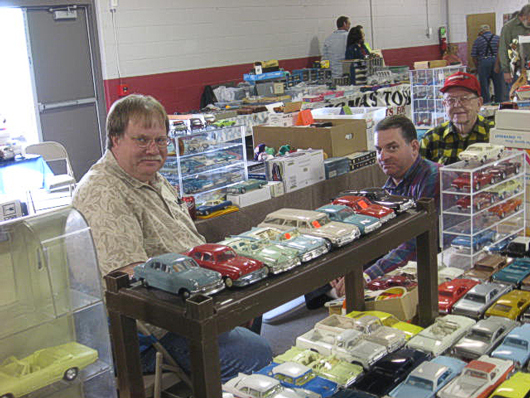 Old car models and newer car models, this display is an example of the excellant scale promotional car offering at the Kalamazoo, Michigan's Circus Maximus Toy Show.